I was asked the other day about the distinction between Customer Data Platforms and Journey Orchestration Engines. My immediate answer was “Some CDPs are JOEs and some JOEs are CDPs. 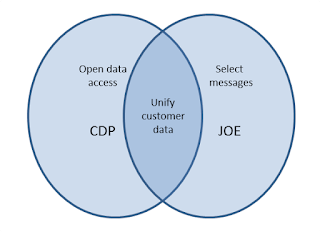 A CDP is a JOE if has journey orchestration. A JOE is a CDP if its data is accessible to other systems. Think Venn diagram with two intersecting circles.” It's not clear the answer helped, but it did get me thinking about clarifying with a Venn diagram. 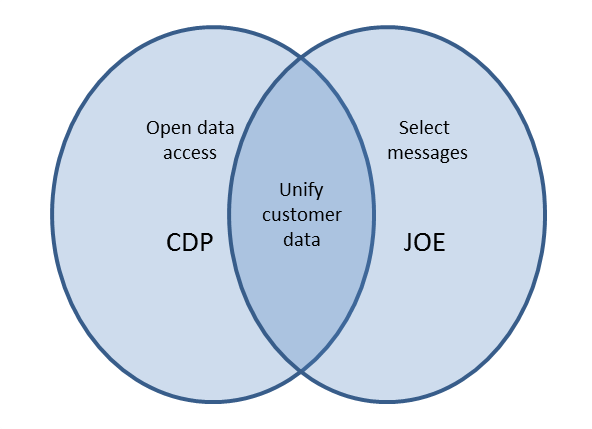 The diagram I originally had in mind was this one, showing that CDPs unify customer data and make it available, while JOEs unify customer data and select messages. Systems that do all three are both a CDP and a JOE. That's fine, but it seems odd that “unify customer data” has no system associated with it. 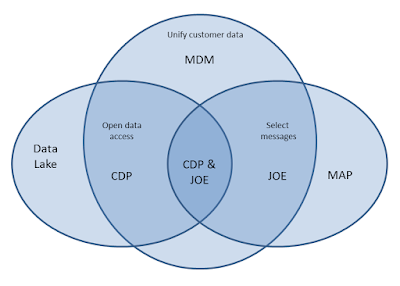 Is there a type of system that just unifies customer data without making it accessible or selecting messages? Come to think of it, there is. 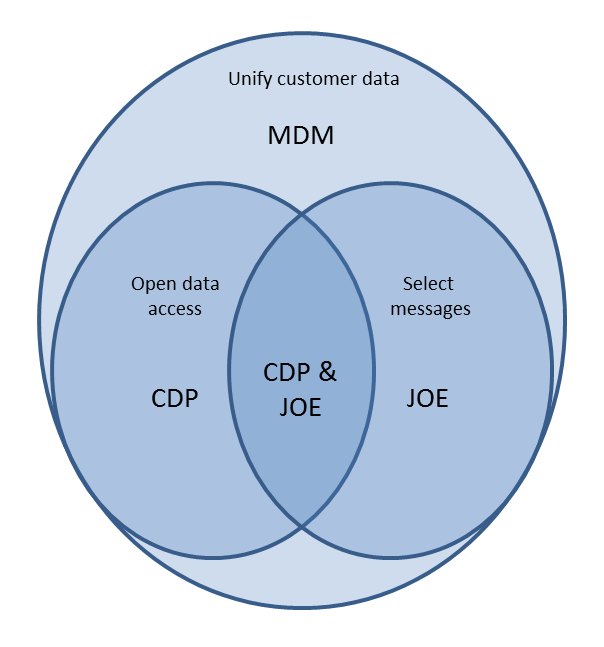 Systems that just do customer matching used to be called Customer Data Integration but I don’t hear that much any more. Sometimes people talk about Identity Resolution but mostly it seems that Customer Data Integration has been absorbed by the larger category of Master Data Management (MDM) systems, which integrate all kinds of data. So let’s add MDM as the label for that. Hmm, what about CRM? In many ways its out there with MAP: another system that selects messages but doesn’t build a unified database. So we need to introduce a new split, of marketer-controlled vs. sales controlled. I'll give control a different color for clarity. 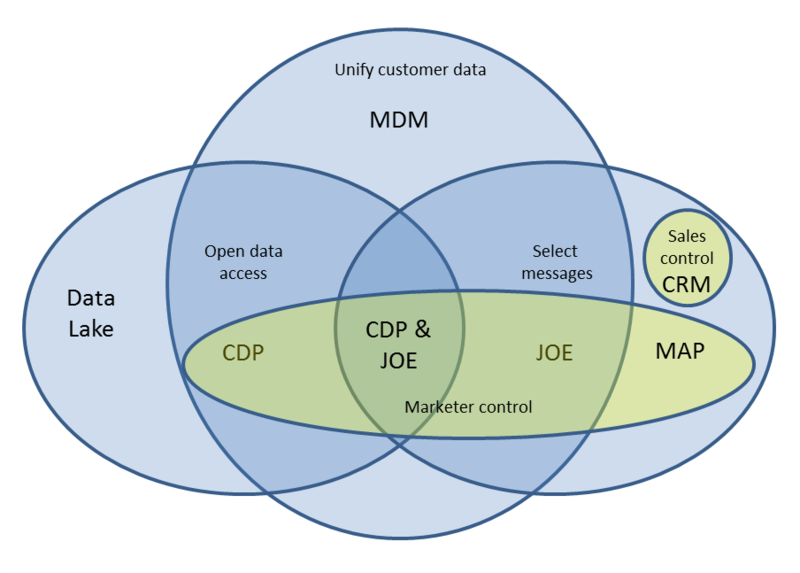 Apologies to CRM people that your circle is so tiny; I'm not suggesting anything about the importance of your systems. Still thinking about control, Data Management Platforms (DMPs) look a lot like Marketing Automation Platforms: they’re marketer-controlled systems that select messages (sort of) but don’t unify data from all sources or provide open access. So unless we want to further subdivide the marketer controlled space, they share the same location as MAPs. 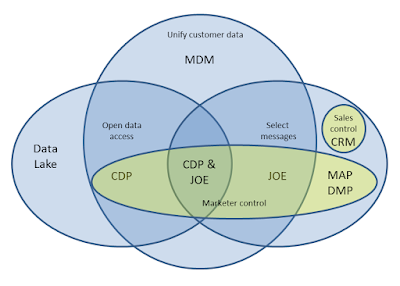 Since control has its own color, Data Lake and MDM jump out as not having an owner. In fact, they’re both typically owned by corporate IT, so we can easily add that circle. This raises one more question: is there an IT-controlled equivalent of a CDP? 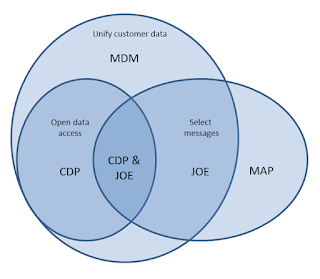 That would be a system that unifies customer data and provides open access but is owned by IT not marketing. You betcha. 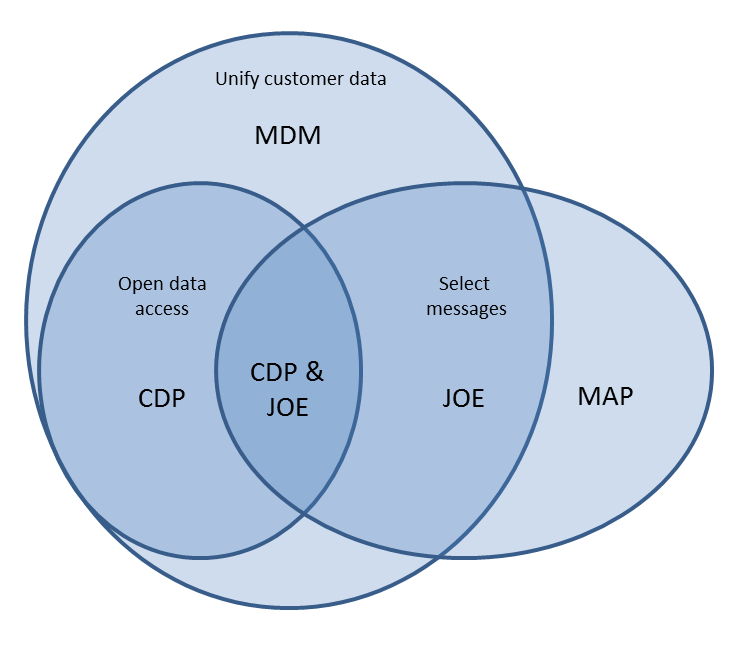 It might be an Enterprise Data Warehouse (EDW) if that has all the access features of a CDP (high speed, flexibility, etc.). But most EDWs don’t meet that standard. So let’s just call it an Enterprise-controlled CDP, or ECDP, if you’re wild and crazy enough to accept a four letter acronym. You’ll remember there’s some debate about whether marketing or IT should really own the CDP. This doesn't provide an answer but it does give a clearer picture of the question. I've summarized this information in a table below. Still confused? We just posted a answers to Frequently Asked CDP Questions on the CDP Institute blog. Maybe that will help.